Imagine you are working full-time in a physically demanding job, but only earn one-third of the minimum living wage! You need to feed four children and take them to school every day. School is an hour away and there is no public transport. You cannot afford a car or a motorbike. There is no gas, no electricity and no water in your house, so before you can make food in the morning or evening, you first have to collect firewood and fetch water. This is the dramatic reality of cacao farmers, which was discussed again this month at the World Cocoa Conference. A situation that is all the more unbearable since thechocolate industry and supermarkets are making record profits on chocolateproducts. Read on to find out why only the right prices as we guarantee them to our farmers offer a way out. The cocoa prices are dependent on the world market price and therefore extremely unstable. This also applies to Fairtrade prices which are above the world market price level, but are subject to the same fluctuations. 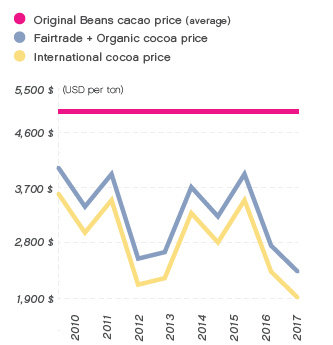 The Cocoa Barometer 2018, published in April, notes that the sharp drop in cocoa prices during 2016 and 2017 has further aggravated the already critical situation for cacao farmers. In West Africa, where most cacao is grown, farmers receive on average only 1/3 of what “Fairtrade International” considers a minimum income! Only direct trade with the farmers and stable long-term prices that offer a living wage (see graph) can claim any fairness towards cacao farmers. We create an additional source of income for our farmers by reforesting cacao and other endemic tree species. This also protects their endangered rainforest environment. In this way, we are counteracting a further development that the CocoaBarometer highlights: massive cutdown of rainforests for industrial cocoa plantations. In West Africa, 90% of the original rainforest cover has already been destroyed. That is crazy since cacao is a shade plant that grows best among other trees in the shadow of the rainforest! That is why our cacao grows either wild or in dedicated cacao forests. And with our ‘One bar : One tree‘ programme we have already planted millions of trees to regenerate these great forests. Thank you for helping us help cacao farmers and their families live a fair and secure life and in doing so preserve rainforests!